their visitor experience and connect them to the community. Plein Air is the premier provider of strategic interactive services to museums and cultural organizations. Museums work hard to cultivate a unique and engaging visitor experience. We work to extend that experience beyond the four walls of its facility, onto the Web, mobile devices and social media points-of-presence. To stay relevant, museums must engage new audiences. We partner with museums to devise an effective digital strategy that exposes them to new audiences and strengthens relationships with existing members, enhancing sustainability. People matter. How people use technology matters. We apply best practices in user experience design to make sure that people who are comfortable with the latest digital technology find your Web site or mobile app engaging. To remain a vital part of our cultural experience, museums must reach out. At Plein Air, we connect all the virtual places where people come in contact with your museum: websites, social media, mobile apps, blogs, e-newsletters. We work with clients to develop a comprehensive digital strategy to find new donors, drive membership, and entice more people to visit. 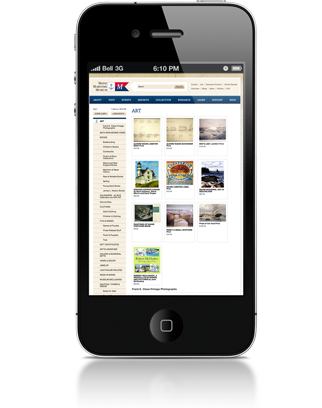 The Maine Maritime Museum has the largest collection of shipbuilding tools in the world. It's the only place in the world where you can tour a working U.S. naval shipyard at nearby Bath Iron Works. The Museum engaged Plein Air to refresh its image and tell its story more effectively. Plein Air carefully analyzed Maine Maritime's strengths and the unique qualities of its visitor experience and emphasized this in developing a new content strategy for the Museum. The goal is to carry this strategy forward consistently everywhere Maine Maritime touches the digital world. Plein Air created a visually stunning site and made it much easier to find information about all that we have to offer. It ties in beautifully with the visitor experience at the museum. I'm sure it will encourage people to visit, become members and support our mission. At Plein Air, we understand that there is a worldwide audience for museums on the web. In the case of Maine Maritime, that meant connecting them with people using search engines to do nautical research. Many of these people might never be able to visit the museum itself, but if the website can meet their needs, we've strengthened ties that could turn information seekers into members or donors. Plein Air devises a communications plan that coordinates the messages put out through a museum's website, blog, Facebook page, Twitter feed, e-newsletters and video channel. We made sure Maine Maritime's site was bulletproof across all platforms and devices, and accessible to people with special needs. We don't spend any time worrying about how our website technology works. We can focus squarely on our online communication strategy. Designing a beautiful museum website is simply a starting point. 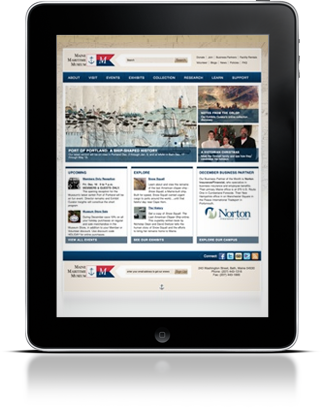 At Plein Air, we realize that Maine Maritime needs a content management system that will let staff quickly and easily update their site drive event registration and showcase exhibits and the collection. For Maine Maritime, we developed a custom version of the Curator™, Plein Air's content management system built on the Django Open Source framework. Designed specifically for museums, the Curator has modules for managing exhibits and collections, and can be customized to integrate with other offline collection management software, making it superior to more generic Open Source frameworks. Amazing! Your CMS is better than WordPress.